We take another venture back into the archives to the 33rd edition of the European Indoor Athletics Championships in Prague in 2015, where the Czech capital put on a show. Between home stars shining in dramatic circumstances and a number of athletes producing record-breaking displays, it was a memorable four days in the Czech Republic, hosting the event for the second time, having been the venue for the second-ever edition, back in 1967. So sit back and take in some of the standout performances from a memorable competition in our Throwback Thursday. 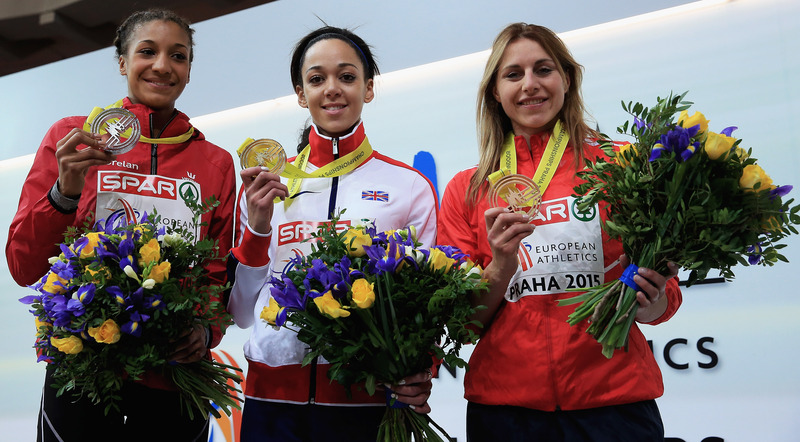 Anyone who was watching the athletics in Berlin this summer will have enjoyed the battle between Olympic heptathlon champion Nafi Thiam and British rival Katerina Johnson-Thompson. The Belgian got the better of it on that occasion, but back in 2015, it was Johnson-Thompson who stole the show in the pentathlon. Dominating from the off, KJT got a personal best in the 60m hurdles and followed that up with the best performance in the high jump. While Thiam moved back into the lead after the shot, Johnson-Thompson produced an incredible 6.89 in the long jump, which would have been good enough for silver in the individual event. That gave her a huge margin for error in the 800m, and she won that event for good measure to finish with exactly 5,000 points, the second-best performance of all time. Day two of the competition was always meant to be the big one for the home crowds as Pavel Maslak went in the 400m as the heavy favourite. The pressure might have got to some athletes, but not Maslak, who cruised through the heats and the semi-finals. And he never gave his opponents a chance in the final, hitting the front by the end of the first lap and stretching away to take victory in 45.33, nearly a second clear of the field. That time was good enough for a Championship record which still stands to this day. In Glasgow 2019, the 60m hurdles should be one of the highlights of the event, and it certainly was in Prague where former European Indoor champion Petr Svoboda carried home hopes. On the day though, he had no answer to the French trio of Pascal Martinot-Lagarde, Dmitri Bascou and Wilhem Belocian, who swept the board. The trio had qualified fastest for the final, and moved quickly clear of the rest of the field in an all-French battle. It was a remarkably tight finish, with 2013 bronze medallist Martinot-Lagarde edging out Bascou in a time of 7.49, with Belocian in third just three hundredths of a second back. If Maslak’s gold medal was expected, Jakub Holusa’s gold in the 1500m was a little more unlikely. The then 27-year-old Czech had come fifth at the previous year’s World Indoors, so certainly had pedigree, but spent much of the final trailing Turkey’s Ilham Tanui Ozbilen. Seemingly having left himself too much to do, Holusa went into the final lap with Ozbilen comfortably in front. However on the final bend he cut his deficit before powering through on the home straight to take an unlikely gold, much to the delight of the home crowd. The pole vault was one of the attractions of the competition with world record holder Renaud Lavillenie in action a year after he had broken the mark set by the legendary Sergey Bubka. The Frenchman was bidding for his fourth European Indoor title and already held the Championship record. The overall victory was never in doubt with Lavillenie clearing 5.75 and then 5.90 at the first attempt to take gold from just two jumps. He followed that up with a clearance at 6.04, the Championship record, and was not that far off the world record when he failed three times at 6.17, the second in particular, coming very close. That win was Lavillenie’s last to date, leaving him joint top for most pole vault victories with East Germany’s Wolfgang Nordwig.